First, I did not grow up in public housing but the presence of ‘the projects’ in the city and suburbia has always fascinated me. I have many friends and family who could tell the story of the projects in a much more memorable way I’m sure. Even living in North Philly, one of the most ‘urban’ places on earth, there was yet another place within the city that would cause even the most desensitized to show caution. You just didn’t walk through the Richard Allen projects. No sir! As I stated before, I didn’t live in the projects but I found myself around these communities within a community. In the 70’s and 80’s my dad owned a business located down the street from the Richard Allen Projects. My brothers and I spent many summers viewing the mayhem that would spill out of the projects down the street. There were other housing projects that would evoke strong emotions when the name was mentioned. The reputation of a place named, “Raymond Rosen” would cause a reaction similar to other infamous drug corners in Philadelphia. My cousins lived across town growing up in the Tasker Projects. I recall dinners, basketball games, slap boxing tournaments, real fights, concrete/tackle football, you name it–it happened there. These homes were rows of 3 bedroom attached homes built to resemble a maze. The Tasker Homes were situated between the 76 Expressway and the oil refineries and the Italian community of South Philly. A rock and a hard place. These projects were originally settled by Anglo families then Black families up to the present. 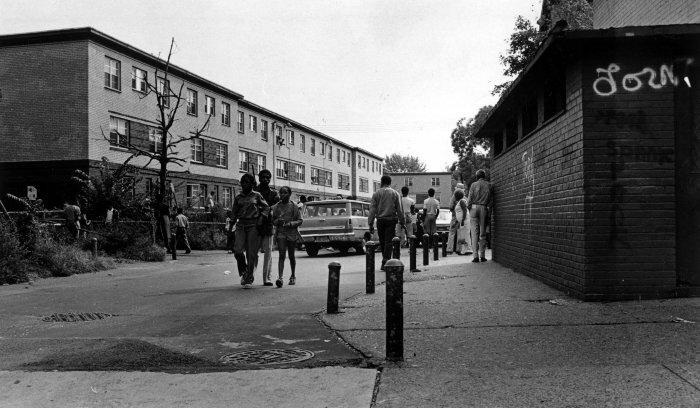 Public housing originally began as a way to address homelessness within urban communities. Eventually, the ‘projects’ became code for violence, overcrowding and third world conditions. My memories are of stench and feeling of isolation and despair. Many kids growing up in these conditions have never been outside of the city limits–these places were a mission field. Even with all the negatives of public housing I still remember the excitement of hanging with my cousins on Sunday afternoons. I was this impressionable church kid anticipating the next exciting event; where are the girls, when will the next fight start, who will tell the next mom joke? I honestly thought my cousins owned the place–they seemed to effortlessly navigate the labyrinth called public housing. 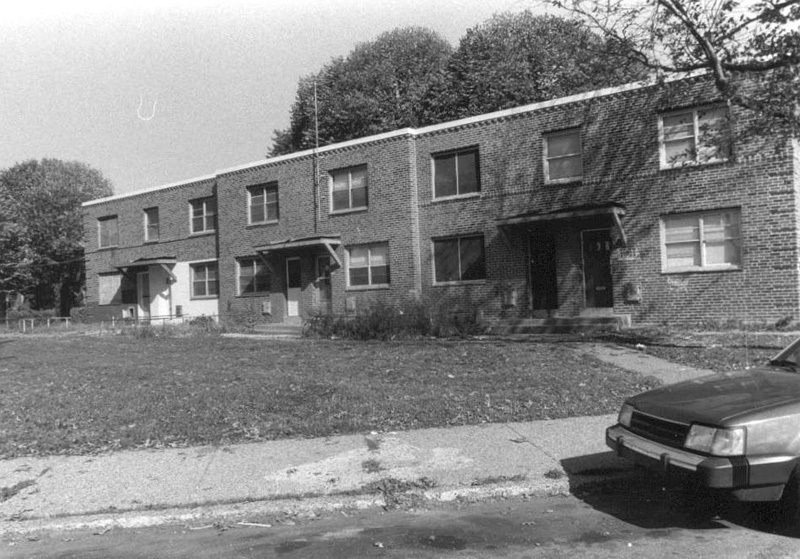 The Tasker Homes carried some painful memories as I lost two cousins to the violence of the 1980’s. In South Philly vacant lots are covered by murals filled with memorialized names of murdered children gunned down in this concrete jungle. In the 80’s and 90’s the preceding generation battled over these small streets and treated blocks like little fiefdoms. The words spoken by Nathanael in the Gospel of John seems to have special application to the projects, “Nathanael said to him, “Can any good thing come out of Nazareth?” Philip said to him, “Come and see.” (John 1:46) The mindset towards this particular place and its culture may match Nathanael’s impressions of the place called Nazareth. There may be those who believe in partial redemption, but the notion that God can reclaim certain kinds of people and places is far fetched. Is any place outside of God’s gracious intent? The question, “can anything good…?” is probably voiced by many who drive past run down city blocks filled with the underrepresented inner city populations. Philip’s response suggests hope. It may be that both Philip and Nathanael knew about this place called Nazareth. Perhaps both are keenly aware that it is a dwelling for the impoverished, uneducated, or unloved. We know Nathanael’s lack of expectation, but on the flip we know of Philip’s witness. 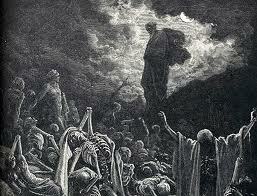 Ezekiel’s vision of the valley of dry bones provides an opulent demonstration of God’s redemptive power. The valley is a picture of an irredeemable situation, ““Prophesy to these bones and say to them, ‘Dry bones, hear the word of the Lord! ” (Ezekiel 37:4) The prophet’s words had a resurrective quality. The old Richard Allen and Tasker Projects, Nazareth and the valley of dry bones are remembered as places of death and despair. However, we must recognize that Christ can show up in the most violent, impoverished places on earth and redeem them for His glory. Philip’s response is an appropriate one–“Come and see”. Christ can convert lifeless concrete into fresh soil where new life can grow. The old Richard Allen and Tasker Homes are no more. They have been either torn down or totally renovated; town homes have now replaced the ominous high rise buildings. These places are a reminder to the church of Christ that no one or place is beyond redemption if Christ is involved. Great insight. Praise God for brothers like you that understand that redemption happens everywhere especially in the places we think are “least of these”. Thanks bro…the projects are a mission field if ever there was one. I remember growing up in tasker projects (1966-1977) during those times I remember the racism especially over the lanier play ground. This era as a young kid made me aware of race and how people coould be so mean. Especiially if one was a biracial child growing up in the projects. Black people never really like nor except you. Neither did white folks. It was as if one was fair game for both cultures. From my early experience growing up in tasker Ive learned to distance myself from others due to the fact that if both races hated each other in the tasker grays ferry area then why did the get together make offspring like me. I never had time for this. Hello my name is Darryl and I was one of the people that you were talking yes I am a true 100% breed straight from the streets of Richard Allen I in jessup place and also Sartain on 11th n Brown and one of the best about Richard Allen it was to dar from downtown. But even though Richard Allen was a small Vietnam I would say that I wouldn’t exchange my young coming up in the streets of Richard Allen for nothing in the world because not all the things there were all bad even though 75% od went on there were negative there was still 25% that was positive even though we were very poor families living in the projects we were all one big family I remember the corner store Mr.Skinny it was very small but there was no one complaining because we learned to make do with what had I learned respect, I gave morale, and dignity amongst a few others I also learned how to make a dollar and not to cherish the mighty dollar b3 it can take you down if you allow it to. I lived in the Tasker Homes projects from 1958 to1966. My image and experiences are completely different. In fact this place was a good place to live. It was very clean, flowers and hedges were everywhere. Clean up crews (approx 10) pushed large carts and picked up any trash on the ground every day. Lawn crews cut the grass everyday (different areas called drives). There was also a painting crew that painted the stoop overhang, garbage can location doors, railings and fences, addresses, and window frames once a year. If a tenant wanted to paint a room; all that was required was asking for the paint and brushes at the maint. shop. Every drive had its own playground, and there was a large community building, open in the summer for kids of all ages. This place offered toys for young kids and plays for older kids to perform in. Tasker projects also featured it own grocery store and next door a pharmacy. Racial mix was about 30% white, 20 hispanic, 30% black, 20% other. There was also an area called old folks park, that we very rarely went into ( because they were old folks). No gangs, and apartments weren’t boarded up when a familt moved out. It wasn’t a bad place to live, but I guess all good things come to end -sometimes.